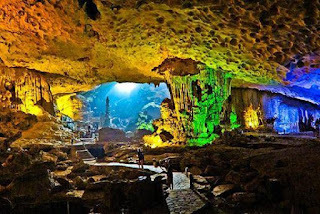 Sung Sot Cave or Surprising Cave is located in the tourist center of Halong Bay and is called with the English name "The cave of surprise". Located in the heart of the World Heritage site - Halong Bay, Sung Sot Cave is on Bo Hon Island. This is one of the largest and most beautiful cave in Halong bay most and also home to many islands with distinctive shapes that you cannot find anywhere. The road to Sung Sot cave is under the lust forest canopy, along with the steep stone steps that makes tourists get the pleasure of climbing as well as the eagerness of discover the surrounding nature. The cave is divided into two chambers, the first one being similar to a wide Opera House. Cave’s ceiling is covered with a layer of silky "velvet" and countless sparkling stalactites , stone statues with different shapes such as stone elephants , seals , flowers ... all seemed like between reality and dream. Still surprised by the magical beauty of the first chamber, we continue to reach the second one on a small path. A whole new scenery opens up with a large space that can accommodate thousands of people. You can find many other interesting things when going further inside the cave. In the Sung Sot cave, the grotto’s ceiling is 30 meters high with many soft concave spots s as decorated with foam that makes it look like a theater hall’s ceiling. A lot of huge stones stand up to the cave’s ceiling near the grotto’s gate. This is one of the typical caves with high scientific value. This is one of the "must-see" place when visiting Halong bay. 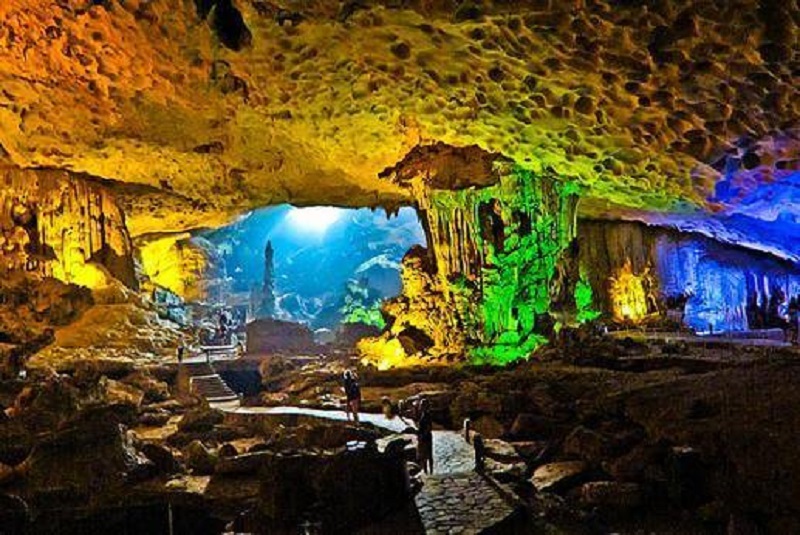 You can join with Viet Nam Typical Tours to have a chance to enjoy the magnificent beauty of Sung Sot cave.